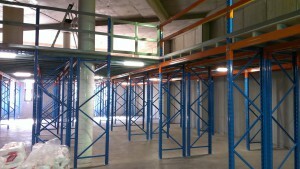 Mezzanine Floor.Rack Supported & Structural Mezzanine. Northside Shelving and Racking have been designing, supplying and installing mezzanine floor or storage systems and raised storage areas for customers around Sydney since 1990. We help you to maximize space of your warehouse/ office without the expense of relocating to a bigger location. Mezzanine floor storage areas find excellent use of space as an office area, storage or easy picking of materials. A mezzanine floor can double the floor area giving a quick return on investment. Our projects range from small, single level floors right through to large, complex multi-tiered installations.We have designed and installed mezzanines floors for odd shaped warehouse units. Our mezzanine floors are of the highest quality complying to worksafe safety regulations. Furthermore, they are consistently more competitively priced than lesser quality installations thanks to the accuracy, efficiency and experience in designing and installing mezzanine storage systems since 1990. We provide an end to end service from site inspection, design, approval, quotation, supply and installation. To complement to our mezzanine floor storage offering, we provide space optimization planning and design, full fitout of office spaces, racking solutions and workshop fitouts. Rack supported mezzanine floors or pallet racking mezzanine floors are the most economic raised storage area solution available. the lower level can still be utilized for storage while the upper level could be office space or for more storage. Our pallet racking mezzanine floors are made from SupeRack pallet racking which are known for quality and strength. 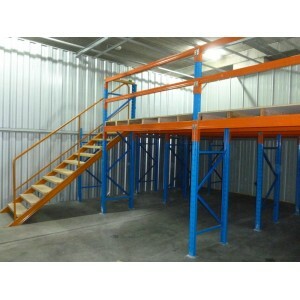 We can also install mezzanine floors using longspan shelving but with lesser load bearing capacity. Pallet racking mezzanine floors are easy to install and dismantle. Pallet racking mezzanine floors approximately cost between $130 to $190 PSQM depending on the total area, floor type and accessories needed. They come with a clear span area of 1.3m to 3.8m depending on the load bearing requirement of the level above. Our mezzanine floors use SupeRack pallet racking. Structural Steel Mezzanine Floors give all the benefits of a raised storage area with the added advantage of maximizing the unrestricted clear space beneath the floor. We offer the best in the industry mezzanine floor solution which are structurally certified for rated loads while keeping costs low. This will ensure a quicker return on investment. 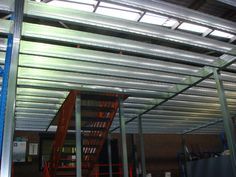 Our structural mezzanine floors are not welded on site and are hence easy to assemble and dismantle. Both the above styles of mezzanine floors are designed and built to comply with worksafe safety regulations. We can design and install mezzanine floors to all regions in Sydney and surrounds.